In Brazil, this was released with both white & blue style covers. The NTSC rerelease has large, block letters, no upper banner, bolder print on the back with a different release date and no mention of Tonka. "Brace yourself for the most realistic racing experience yet. And to play, you've got to have what it takes: NERVE, SKILL and BRAINS. NERVE - you're behind the wheel of a supertuned race car with one speed only: fast. 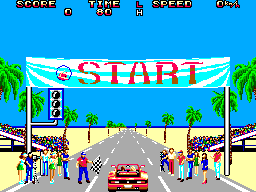 SKILL - you're maneuvering a car that can nearly reach a simulated 270 KMH. BRAINS - because you're in control of your car's speed and handling at a dangerous pace, you have to use your head and not just your hands to survive. So ge geared for the ride of your life and stay alert. The track may look terrific, but at these speeds anything can turn into a danger zone. 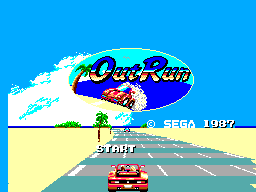 Out Run - the exciting home version of the original video arcade game created and made available exclusively by Sega." 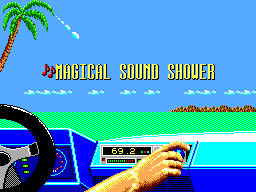 At the song selection screen, press Right, Left, Down, Up, and then select a song and press 1 to hear it play. After you enter the sound test code and start a song playing, press Up, Down, Left, Right, Right, Left, Down, Up, then either Left or Right + 1 to start with 75 seconds, or Down + 1 to start with 70 seconds on the timer instead of the usual 80 seconds.